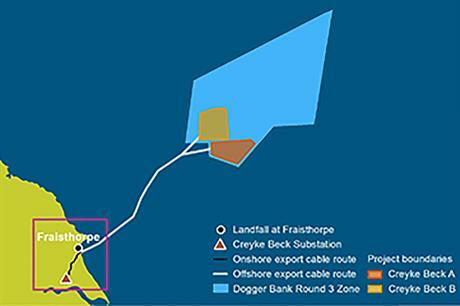 UK: The UK government has approved the plans for Forewind's Creyke Beck A and B projects, consisting of 2.4GW of the Dogger Bank zone. Plans for the projects include the erection of 400 turbines being installed at the site 131 kilometres off the UK's north east coast. Creyke Beck A and B at 515 square kilometres and 599 square kilometres respectively. Forewind said it had spent £60 million to carry out studies of the area – the most ever undertaken for an offshore wind project. The entire Dogger Bank zone is expected to reach a total capacity of 7.2GW across six 1.2GW projects. Investment issues forced the Forewind consortium to reduce the Dogger Bank zone from a planned 9GW to the agreed 7.2GW. Members of the consortium are German firm RWE, Scottish utility SSE, and Norwegian state-backed developers Statkraft and Statoil. The Planning Inspectorate is currently reviewing the second phase of the Dogger Banks zone, Teesside A and B. A final decision is expected in August.